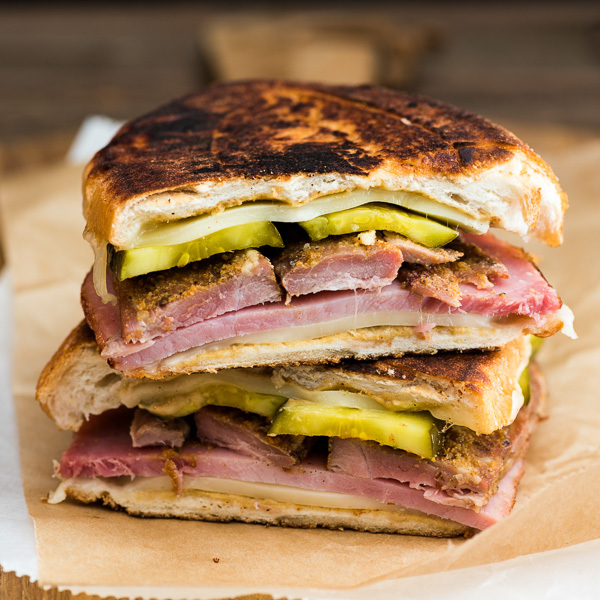 Spice up your lunch with this super scrumptious Cubano Sandwich! A Cubano sandwich is a pork sandwich that is easy to make, yet super rich in flavor. To make the real-deal sandwich, using two types of pork is a must – deli-style ham and roast pork loin. To get these ingredients, simply stop by the deli counter of any large supermarket. Use thicker slices of ham and pork loin, so you can make your sandwich extra rich. After getting the main ingredients, you just need to brush the bread with plenty of mayonnaise and mustard, add sliced cheese, and pickles. That’s it! To finish up the sandwich, the most convenient way is to use a sandwich press. If you don’t have one, no worries! You can grill the sandwich using your frying pan on the stovetop, and it’s really easy. I used a cast iron pan for weight on top of the sandwich, to mimic the effect of a sandwich press. You can use any heavy pot or dutch oven to achieve this. Don’t have a heavy pan? Use a deep pot and fill it with water. 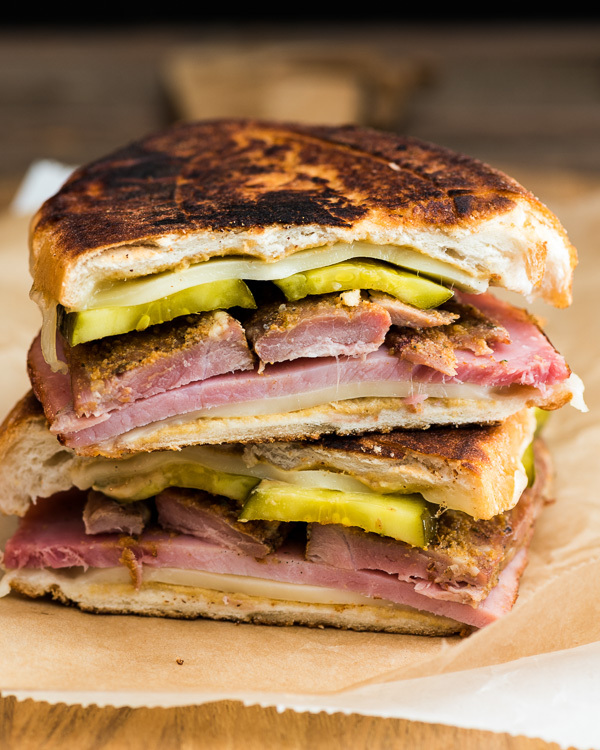 The Cubano sandwich can be made ahead of serving. After toasting the bread in the pan, wrap the sandwich in foil and store it in the fridge for 1 to 2 days. You can heat the sandwich in the oven right before serving. The bread will stay crispy and the sandwich juicy. Ready to make some delicious sandwiches for your picnic? Let’s get started! Generously brush the cut sides of the baguette with mustard and mayonnaise. Layer with half of the cheese, ham, pork, pickles and then the rest of the cheese. Close the sandwiches with the other half of the baguette. Generously butter the outer surfaces (top and bottom) of each baguette. Heat a large cast iron pan over medium heat until hot. Place the sandwiches in the pan. Top with a second cast iron pan to weigh the sandwiches down. Cook until the bottom side is charred and crispy, about 2 minutes. Turn to medium low heat. Flip and sandwiches. Weigh down with the other skillet. Cook for another 1 minute, until the bottom turns golden and the cheese is melted. Transfer to a working surface to cool.